The Xenics Gobi series is a range of smart, affordable, uncooled microbolometer long-wave infrared (LWIR) cameras for thermal imaging in a very compact housing. With excellent image quality, high thermal resolution (0.050° C) and accurate thermal quality control, Gobi guarantees to be a versatile industrial tool. With the Xeneth software, all camera functions can be optimised according to the user applications context, including four different display modes. The camera offers frame rates of up to 50 Hz and can be supplied with the optional thermography calibration. 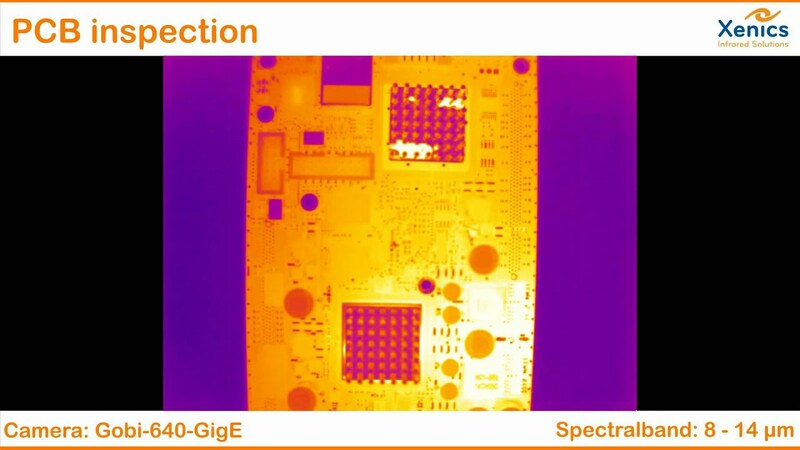 The Xenics Gobi-640-GigE thermal camera allows you to detect hot (defect) components on Printed Circuit Boards (PCBs). Early detection of resistors that are running too hot allow system engineers to evaluate and replace the defect which saves a considerable amount of time and costs. The particular technology used by Xenics ensures minimal thermal crosstalk beteween the detector elements, resulting in an exceptional resolution. As a result, it makes thermal radiation visible in a way that processes can be observed that are invisible to other technologies. With radiometric calibration, it is even possible to measure absolute temperatures in the images. The cameras offer a high degree of flexibility in terms of frame rate, integration time, user interface and temperature range, enabling the user to fully adapt it to the given application. The Xeneth SDK and graphical user interface offer access to all camera functions, without the need to be a thermal camera expert. The series offers standard interfaces as CameraLink and Ethernet (GigE Vision with PoE) for an easy and flexible connection to the PC. The Gobi has been designed to resist shocks up to 40 G for 11 ms (according to MIL-STD810G) and vibrations up to 5 G (20 Hz to 2,000 Hz) without being damaged. This is a particular advantage for mobile or aerial applications. An uncooled microbolometer consists of thermally isolated ‘microbridges’, with a temperature sensitive material deposited on top. The temperature sensitive material can be either vanadium oxide (V2O5), amorphous silicon (a-Si) or silicon germanium (poly-SiGe). The microbridges are surface micromachined directly on the circuits. Because the IR absorbing microbridges are thermally isolated from the rest of the sensor, this allows the IR energy that is absorbed by each pixel to remain unaffected by the energy in the rest of the sensor, increasing the image fidelity. Xenics microbolometer cameras use this microbridge technology which allows the construction of contact supports that exhibit an optimum compromise between good electrical conductivity, essential to read-out the pixel elements, and a poor thermal contact, which prevents thermal ‘leakage’ of the absorbed radiation. XENICS GOBI-640-17-50-CL 0.3 50 640 480 1"
XENICS GOBI-640-17-50-GE 0.3 50 640 480 1"